2Q19 Revenue and PATMI were in line with our estimates. Derivatives business exceeded our expectations by 13.2%, with a surge of 23% YoY in volume; driven by equity derivatives and FX futures. Securities business missed our estimates by 22.6% as the weaknesses in emerging markets and concerns over economic conditions continue to trouble sentiments. Interim dividend declared at 7.5 cents/share (Up 50% from 2Q18’s 5 cents/share; due to a change in dividend policy announced in 4Q18). 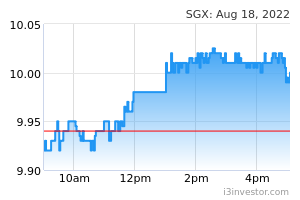 We maintain our BUY recommendation for SGX at a lower TP of S$8.36 (previously S$9.01) as we peg our TP to 23.2x P/E, +0.5 SD above SGX’s 5-year mean (previously 25.2x). + Derivatives achieved a second consecutive quarter of record revenue at S$112.9m, rising 35.4% YoY; offsetting the decline in equities and fixed income revenue. Derivative volume spiked 23.4% YoY, reaching a record high of 60mn contracts in a quarter. Derivatives revenue was driven by trading volume, particularly in key equity derivatives (+21% YoY) and FX futures volume (+61% YoY), which benefited from higher volatility in the underlying market. Derivatives enjoyed higher collateral management income of +64.0% YoY due to the garnering higher open margin interest (average quarter-end open interest rose 10.2% YoY due to rising interest rates) and larger account balances in the MSCI NTR product suite due to greater product adoption. However, the average fee per contract declined 3% YoY to S$1.05 due to changes in product mix towards lower yielding products. + Market Data and Connectivity revenue rose 6.5% YoY, accounting for 12% of total revenue, similar to last quarter. 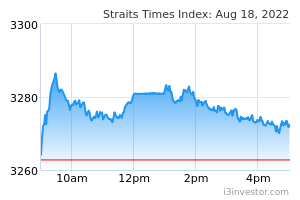 The growth was mainly due to the 9.4% YoY spike in Connectivity revenue with the continuous expansion of SGX’s colocation services business. Market data revenue grew 2.7% YoY. – Equities revenue contracted for the second consecutive quarter at -12.8% YoY, the slowest in two years. Slower equity activities were caused by current weaknesses in the emerging markets with rising trade tension, concerns of rising U.S. interest rates and a slowing global economy. SDAV contracted for the second consecutive quarter at -13.9% YoY. Average clearing fees for Equities and Other products were down 2% at 2.87 bps (2Q18: 2.93 bps) and 0.55 bps (2Q18: 0.51 bps) respectively, due to increased trading from market makers and a higher proportion of lower-yielding Standard Warrants and Daily Leveraged Certificates. – Fixed Income revenues fell 11.7% YoY. Issuer Services declined 6.6%. Despite 296 bond listings that raised S$122.3bn (2Q18: 289 listings raised S$103.5bn), there were only three new equity listings which raised S$19.0mn as compared to seven new equity listings raising S$1.6bn a year ago. Post-Trade Services was down 15.8% YoY due to decreasing subsequent settlement activities, and we believe that this segment is stagnating and would not contribute meaningfully to SGX’s growth in FY19. Securities settlement revenue decreased 13.6% YoY due to downward repricing of DVP guarantee fee and a decline in subsequent settlement activities following completion of broker-migration in February 2018. Both NSE and SGX sought a joint consultation and had recently submitted a joint proposal to their respective authorities. With a joint discussion in place, the proceedings have been deferred, and trading will go on as usual until two months after the Indian Court makes a decision (if SGX loses the case). In either way, the Nifty-Fifty license will terminate. The injunction is to prevent SGX from releasing a new product. The arbitration remains a financial risk whose outcome has yet to be set in stone. SGX’s earnings growth will be supported by a robust multi-asset business strategy, volatility, operating leverage and a strong balance sheet. We believe that continued stock-market volatility driven by trade tensions, rising interest rates and geopolitical events should benefit derivatives turnover as seen from the record highs in derivatives volume in the past two quarters. The IPO and equities business will inevitably be tied to investor sentiments. In the meanwhile, the boost in derivatives business volume and product offerings will be more than sufficient in supporting earnings growth. SGX’s debt-free balance sheet and monopoly helps in facilitating inorganic growth. We maintain our BUY recommendation for SGX at a lower TP of S$8.36 (previously S$9.01) as we peg our TP to 23.2x P/E, +0.5 SD above SGX’s 5-year mean (previously 25.2x). SGX’s attractiveness as an investment in the medium term remains intact with superior ROE, dividend yield and attractive valuation. SGX is a defensive stock with consistent and diversified earnings, valuation and dividend support for resilience in an uncertain environment.